BOSS® Multi-Seal® is a new formulation of sealants using USP® Technology. 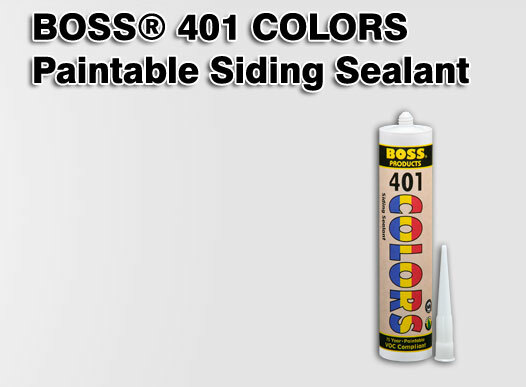 BOSS® Multi-Seal® products are packaged in all-weather plastic cartridges, and all bond to wet/damp surfaces! 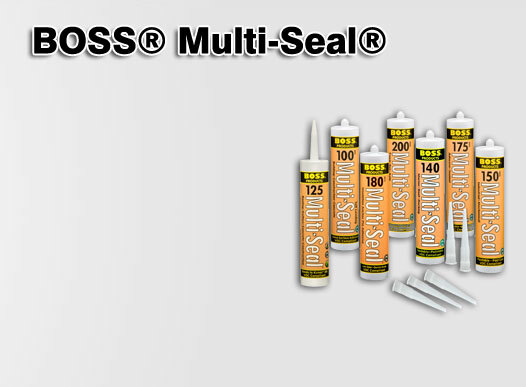 Don’t let a sealant bring the job to a halt, use BOSS® Multi-Seal®. BOSS® 180 Multi-Seal® Insulation Anchor Pin System Adhesive (Patent Pending) is a new approach to installing insulation. It is a cleaner, faster approach with no brushes, no messy spills, and no time consuming cleanups! A new paintable sealant custom matched to over 400+ colors from 40+ manufacturers! BOSS® 401 is solvent-free, mildew resistant, and permanently flexible. 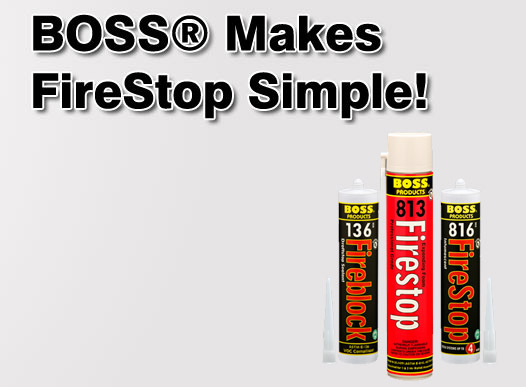 BOSS® now offers a new solution for fire blocking. 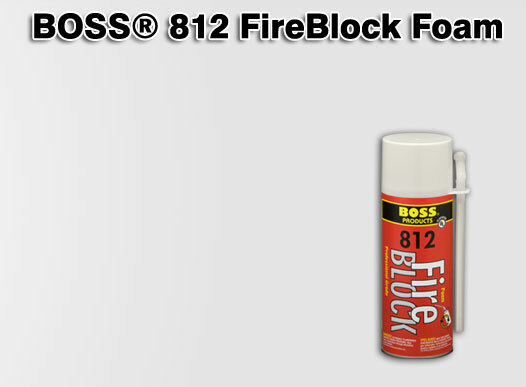 BOSS® 812 FireBlock Foam is ideal for single and two family homes to prevent the spread of smoke and toxic gases in case of fire. BOSS® 812 is 360° dispensing and installs in seconds, reducing labor costs up to 90%! BOSS® offers a variety of UL Recognized products to help prevent the spread of fire, smoke and toxic gases through construction openings. Check out our complete Firestop Systems guides available online. 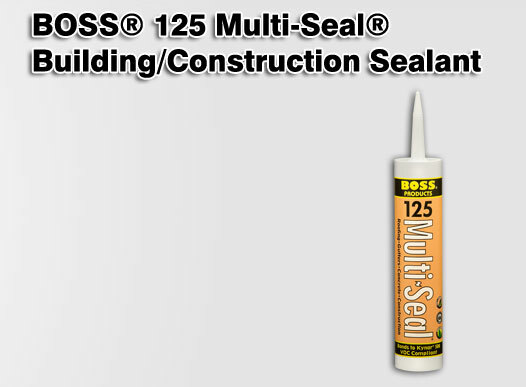 BOSS® 125 Multi-Seal® Building/Construction Sealant is a multi-purpose, one part sealant formulated with USP™ technology to form a highly durable, flexible seal. This unique sealant can be applied and tooled under most weather conditions, and can bond to wet/damp surfaces! 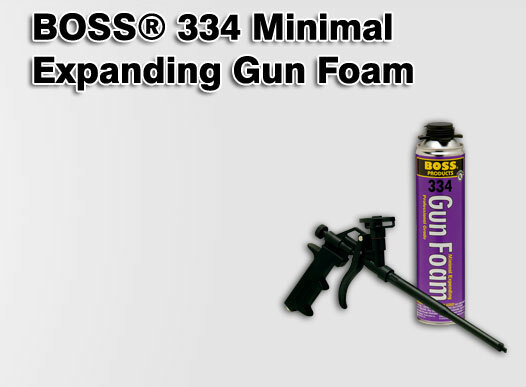 BOSS® 334 Minimal Expanding Gun Foam is a ready-to-use foam gun that offers superior control during installation. Application is precise and expansion is low, reducing the mess and damage. 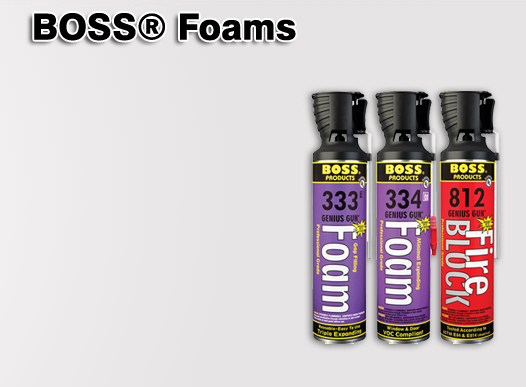 BOSS® 334 Minimal Expanding Gun Foam is AAMA 812-04 approved! BOSS® Foams are now available with our patented Genius Gun technology. The Genius Gun allows you to accurately deploy foams quickly and easily without using an external foam gun. BOSS® offers a wide variety of products, from state-of-the-art adhesives and industrial sealants to anti-seize compounds. BOSS® technology and quality ensure these products will perform to the highest levels, for industrial, construction, pool & spa, HVAC/R, and manufactured housing and RV markets.